Q. 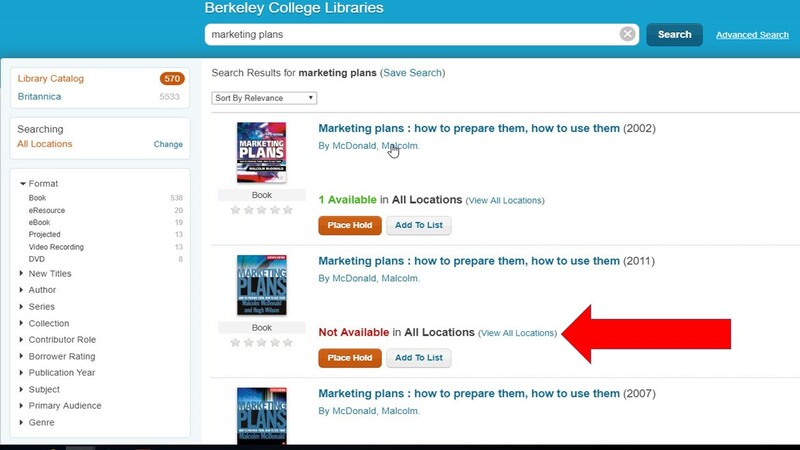 Are there books available at the library on creating a marketing plan? Print Books: There are several print books available on marketing plans at various Berkeley College campuses libraries. To find books and their availability you'll need to access the library page on Engage or in your Canvas course (see below). Once on the Library website, click on the button for the library catalog. 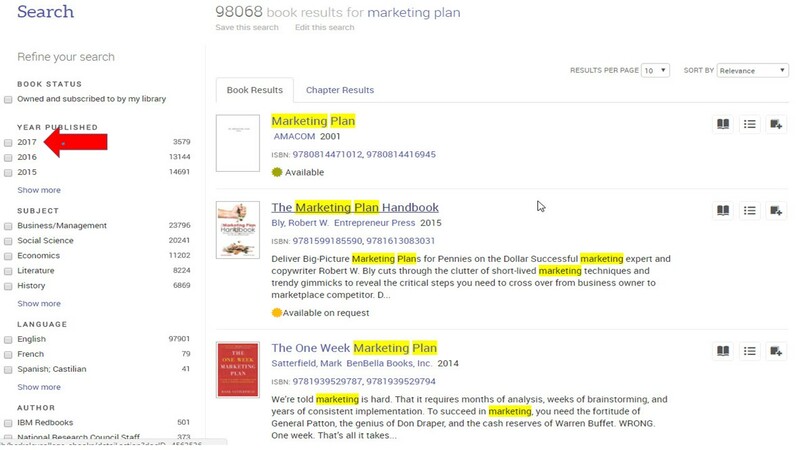 Once in the online library catalog, you can type in the search box 'marketing plans' as keywords and book titles based on those keywords will appear in the results list. You can click on any title from the list to check for the call number, it's campus library location, and its availability status. If the book is not located at the campus library you would normally use, you can request a hold on the item (using the 'place hold' button). The image below shows an example of a results list from the online library catalog using these search terms. The first book is available, but the second one (near red arrow) has been borrowed by someone else. E-Books: There are also ebooks available on this topic, via the library's Ebook Central database, which contains over 140,000 online full-text books. This is contained in the library's database page (via the library on Engage or your Canvas course). Use the same steps used to find the online library catalog, but this time choose the 'A to Z Databases' button. You can use the same search terms as was done to find print books within Ebook Central, specifically the search terms "Marketing plans." A results list for these search terms is shown in the image below. Note: you can generate shorter results lists by choosing a specific publication year (2017) which is on the left side of the results list. You can also use more specific keywords in your search, like "Social Media" and "Marketing Plan".